From left to right: Fred, Velma, Scooby, Shaggy, Daphne. A popular Saturday Morning Cartoon from Hanna-Barbera that premiered in 1969 and quickly became one of the most popular animated franchises in history. Through various retools over the decades, it has survived long enough to outlive all of its original creators, three of its original voice actors, and the very studio responsible for it. At its core, the series features four teenagers  Fred Jones, Daphne Blake, Velma Dinkley, and Norville "Shaggy" Rogers  along with their talking dog Scooby-Doo, road-tripping in a van called the Mystery Machine. The basic plot, especially in the original incarnation of the show, usually involved the gang encountering a mystery involving some form of spooky monster which, more often than not, turned out to be a hoax meant to frighten the locals away from the villain's real operation, and would be resolved at the end by unmasking the villain, who would inevitably utter a variant of "I would have gotten away with it if it hadn't been for You Meddling Kids, and that dog too." After a decade (during which time several gimmicks, including celebrity cameos, were employed to try and keep the show fresh), the writers finally ran out of ideas. In a last-ditch effort to avoid cancellation, Scrappy-Doo was added to the cast in 1979. 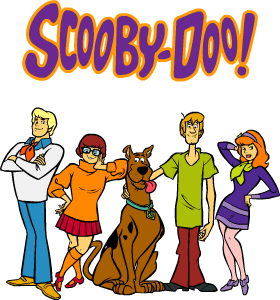 Toward the end of Scooby-Doo's initial run, the writers dropped Fred, Daphne and Velma from the series (because they were too "boring") and the show's format rapidly changed into a throwback to the throwback style common to pre-Scooby H-B cartoons with just Scooby, Scrappy, and Shaggy. Daphne returned eventually to fill The Chick position, and the show returned to its "Scooby-Doo" Hoax roots in a Two Shorts format with the odd guest appearance from Fred and Velma. Eventually, the franchise was rebooted as a series with real ghosts and Vincent Price, then a trio of Direct-to-Video movies (which contain the final animated appearances of Scrappy-Doo), then a series featuring prepubescent versions of the cast. By the early-to-mid-90's, the franchise was basically moribund: Scooby-Doo's voice actor passed away and Hanna-Barbera was absorbed into Time Warner's media empire, beginning their gradual overhaul into Cartoon Network Studios. However, an extremely well-received direct-to-video movie in 1998 jump-started the franchise, including one new DTV movie per year since 2000, several new and highly ambitious TV shows which either use, play with, subvert, or even ignore the classic formula (and are utterly unconnected to each other), and the occasional video game. The Turn of the Millennium saw the release of two theatrical Scooby-Doo movies, one in 2002 simply titled Scooby-Doonote The last HB spinoff project to be overseen by both of its company's founders. Bill Hanna died in 2001, a year before the film was released. and its sequel, 2004's Scooby-Doo 2: Monsters Unleashednote The last HB spinoff project to be overseen by Joe Barbera, who died a year later, starring Sarah Michelle Gellar of Buffy fame as Daphne and her husband Freddie Prinze Jr. as Fred. They were followed by two made-for-TV prequels, which featured a different cast. All four were loaded with Continuity Nods, and lampshaded the show's own clichés. A live-action prequel series focusing on Daphne and Velma is also planned as of 2018. There have been several Scooby-Doo comic book adaptations over the years, through Western Publishing (Gold Key Comics imprint), Charlton Comics, Marvel Comics, Archie Comics, and most recently DC Comics (also owned by Time Warner). As of 2015, the Scooby Doo, Where Are You comic was the longest-running non-superhero DC title. Most Scooby comics consist of stories similar to the original cartoons, with the occasional crossover with other Hanna-Barbera cartoons or DC superhero property. In 2016, as part of a new line of "reimagined" Hanna-Barbera cartoon titles aimed to older audiences, a new Alternate Universe comic called Scooby Apocalypse was announced . As you might have guessed, it's Scooby-Doo IN THE APOCALYPSE! This also features yet another radical redesign and shift to modern times for the ol' gang. In 2005, the shownote (as an aggregate of all the series produced under the Scooby-Doo banner) briefly beat The Simpsons for most episodes produced of an American cartoon. After so many years in both first-run and reruns, this franchise is so thoroughly embedded in American popular culture that even people who have never seen it are familiar with it. It's also earned more than a few shout-outs from other franchises; the ad-hoc vampire-hunting team that formed around Buffy Summers in Buffy the Vampire Slayer called themselves "The Scooby Gang".note The actual Scooby characters never refer to themselves as such; whenever their group was given a name in-series, it's always been "Mystery, Inc."note 2 That is until S3E3 of What's New, Scooby-Doo?, where the gang is called "The Scooby Gang" by everyone when they return to their hometown. It has also become Cockney rhyming slang for "clue" (as in "Haven't a Scooby, mate"). In 2018, one of the biggest-profile tributes to the franchise occurred when the TV series Supernatural aired a full-out animated crossover episode that re-introduced the characters to a new generation of viewers (while also attracting first-time viewers to Supernatural). Make sure to visit the Characters page, and don't overlook the Analysis. See the Shout Out page here. Scooby-Doo, Where Are You! (1969-1970 CBS) - The original classic series, and the "bread and butter" core of the franchise. Despite it being a major hit from the start, only 25 Episodes were made across two seasons. NOTE: A set of episodes of "The Scooby-Doo Show" made in 1978 for ABC had been tagged as an unofficial third season in their original broadcasts (being shown with the original opening/closing sequences), but all subsequent airings feature the proper "Scooby-Doo Show" opening/closing, thus removing the connection. That hasn't stopped them from being released to DVD as "Season " of Where Are You. The New Scooby-Doo Movies (1972-1974, CBS) - This featured appearances from animated versions of real life celebrities and crossovers with other Hanna-Barbera cartoons. Unlike all the other series, the episodes of this series were an hour long with commercials (though some syndicated broadcasts split episodes into two standard half hours). Otherwise, this show mostly followed the classic formula. 24 Episodes (or 48 split-episodes). The Scooby-Doo Show (1976-1979, ABC) - A return of the original "Where Are You?!" formula, but with a slightly (yet noticeably) cheaper budget and occasional appearances from Scooby-Doo's relatives (e.g. his cousins Scooby-Dum and Scooby-Dee). 40 episodes. NOTE: The original broadcasts of these episodes were featured in package shows like "The Scooby-Doo/Dynomutt Hour" (Eps. 1-16), "Scooby's All-Star Laff-a-Lympics" (Eps. 17-24), and "Scooby's All-Stars" (Eps. 25-40). Eps. 25-40 were originally shown with the opening titles of "Scooby-Doo! Where Are You?!" (not attached to a package show), and is often seen as a sort of third season of the original series (and have been released to DVD as such). Dynomutt, Dog Wonder (1976-1977, ABC) - The gang are featured in three crossover episodes. Scooby's All-Star Laff-a-Lympics (1977-1979, ABC) - Renamed Scooby's All-Stars in second season. Crossover with other Hanna-Barbera characters. 24 Episodes. Scooby-Doo and Scrappy-Doo (1979-1980, ABC) - Scrappy's debut. Basically "The Scooby-Doo Show" with Scrappy. 16 Episodes. The Scooby-Doo and Scrappy-Doo Show (1980-1982, ABC) - A completely different formula, with only Shaggy, Scooby, and Scrappy being caught in various adventures in seven-minute shorts (three-per-episode). 33 Episodes (99 Shorts). Of the 99 shorts, 13 didn't feature Scooby-Doo, instead featuring Scrappy-Doo with his other uncle, Yabba-Doo in the west. NOTE: Similarly to The Scooby-Doo Show, these episodes were broadcast in package shows. The first 20 episodes (60 segments) aired with Richie Rich (1980) and the latter 13 episodes (39 segments) aired with The Puppy's New Adventures. The New Scooby-Doo and Scrappy-Doo Show (1983-1984, ABC) - Return of the "mystery" formula, but only with Shaggy, Scooby, Scrappy, and Daphne as the lead characters. 13 Episodes. The New Scooby-Doo Mysteries (1984-85, ABC) - A continuation of the previous series, but with occasional appearances from Fred and Velma (both appearing in two episodes each, including one together, reuniting the gang). 13 Episodes. The 13 Ghosts of Scooby-Doo (1985-1986, ABC) - A new formula, and the first retool to be considered a completely separate series; basically a twist of the previous two shows, featuring new characters (Flim Flam, Vincent Van Ghoul, and villains Weerd and Bogel), the voice of Vincent Price, and was the first Scooby-Doo show featuring an overarching storyline, though the show's cancellation left it unresolved. 13 Episodes. A Pup Named Scooby-Doo (1988-1991, ABC) - Features a more modern animation style, with the gang solving mysteries as kids. The series was the first time the franchise acknowledged via good-natured self-referential parody the clichés and tropes of the original formula. 31 Episodes. What's New, Scooby-Doo? (2002-2006, The WB) - A new series, returning to the original format, but with a very contemporary style. 42 Episodes. The first TV series in the franchise to be produced by Warner Bros. as a consequence of the Time Warner/Turner merger of 1996. Shaggy & Scooby-Doo Get a Clue! (2006-2008, The CW) - A big departure from the original formula, featured an overarching story, but only with Shaggy and Scooby (and a few appearances from Fred, Daphne, and Velma), and Scooby portrayed as being more like a cyborg. 26 Episodes. Scooby-Doo! Mystery Incorporated (2010-2013, Cartoon Network) - Features a slightly enhanced version of the original design, an overarching plot, a twist on the classic formula, occasionally darker storytelling, as well as appearances from some other Hanna-Barbera cartoons. 52 Episodes. Be Cool, Scooby-Doo! (2015-2018, Cartoon Network / Boomerang) - This incarnation falls back on the classic premise as the gang hits the road on summer vacation only to bump into mysteries and monsters. Like A Pup Named Scooby-Doo, focuses largely on humor and self-parody of its own cliches. Notable for being the first series (not counting the prequel A Pup Named Scooby Doo) to make a radical departure from the character designs in place since 1969, although most of the current voice actors returned. Scooby-Doo and Guess Who? (2019-, Boomerang) - In this iteration, the gang meets celebrities in cartoon form as well as established fictional characters, similar to The New Scooby-Doo Movies. Velma losing her glasses, especially in the earliest series (she's Blind Without 'Em). Catch Phrases: "Zoinks!" for Shaggy, "Jinkies!" for Velma, "Jeepers" for Daphne. Scrappy had two: "Let me at 'em, Let me at 'em!" and "Da-da-da-da-da-da, Puppy Power!". Not to mention the infamous "Let's Split Up, Gang!" for Freddy as well as "Looks like we have another mystery on our hands! ", and of course, Scooby's "Scooby Dooby Doo!" and "Rut Roh!" In some of the newer episodes/movies, Scooby responds to any mention of a dog with "Rog? Rwhere?" A Pup Named Scooby-Doo mercilessly lampooned and lampshaded these. And invented several new ones. And then lampooned and lampshaded those. Scrappy's attempts to use physical violence against the "ghost", almost always stopped by Scooby grabbing him by the scruff of the neck. Lampshaded in the Loch Ness Monster movie by Daphne's cousin Sharron, who describes the Blake family as a whole as being the type to get caught in all sorts of traps and kidnappings, summing it up as being "Danger Prone". A mural on the wall of the family castle behind her even depicts this. A long slapstick-filled chase sequence with upbeat music playing in the background. "Scooby-Doo" Hoax is nearly universal, although a few later movies and movie-length episodes, and Thirteen Ghosts, had the ghosts turning out to be real. The New Scooby-Doo Movies (and, once, A Pup Named Scooby-Doo) also featured real monsters as guest stars, with the real monsters haunted by a fake one! The show likes playing with the trope as much as it likes playing it straight. The monster in the first-season episode "Foul Play in Funland" was technically "real", though there was nothing supernatural about it. to reveal a character she had never seen before. Velma calls a foul and declares it doesn't count. The Summation at the end of the episode, where the gang thoroughly debunks all of the supposed paranormal activity and explain its role in the criminal racket they have uncovered. Sometimes there was no crime committed, and the hoax was performed for a noble reason (for example, in "Haunted House Hang Up", the first time this occurred, the culprit disguised himself to scare people away, not to cover up some criminal behavior, but because he was afraid somebody would steal his family treasure). One or more characters who come across as particularly suspicious, yet turn out to have nothing to do with the actual plot. A Pup Named Scooby-Doo went so far as to make one a regular supporting character with the actual name "Red Herring". The ghosts being real, at least for two series and The 13 Ghosts of Scooby-Doo. Amusingly, it's sometimes reversed, with Shaggy jumping into Scooby's front legs. Other times, Velma carries the whole gang in her arms. Several versions of the opening credits incorporate a Bat Scare, and this happens occasionally in-story also. The Cartoon Network revival in the early 2000's used the franchise characters in comedic vignettes that lampshaded most (if not each) of the above tropes. Fred swinging his arms and plodding heavily. Daphne leans forward slightly while running, her hair flowing. Velma runs with her shoulders back and arms hooked, and her bust out. Shaggy runs leaning forward extremely, almost at a 60 degree angle. Running with all legs spinning like propellers (most of the time). Shaggy losing Scooby and calling for him with "Scooby-Doo, where are you? ".